Islam is one of the few religions which state that no human being can perform miracles . But for a religion to survive, miracles are a must. If we visit some of the mosques and darghas we will find that many miracles are believed to occur there. Though the Prophet Muhammad destroyed almost all idols and idol-wor­ship, he failed to completely wipe out idols. There remains one stone in Kaba worshipped by Muslims. This is because gullible people need something to hold on out of fear of the present and the future. Only true education can make people courageous and fearless to face the reality. While in Maharashtra I came across a dargah in Shivpuri, where a stone of 70 kg was raised on the finger tips of eleven believers and this was considered a miracle. Kamarali Darvesh, a muslim saint who died 700 years ago is buried there. Eleven believers keep their index finger under the stone and singing in unison the name of Kamarali Darvesh, lift the boulder of sand stone on their fingers. We demonstrated that a similar stone of 70 kg could be lifted by four people on their index fingers. Effect: Four volunteers lift a 70 kg. boulder on their index fingers without feeling its weight. Props: A round stone weighing 70 kg. Method: Stand on four sides of the stone with your index finger under the stone. When "one, two, three" is said, be ready and when "up" is said, raise the stone on the finger tips. The stone rises up without the volunteers feeling any weight because the weight of 70 kg is distributed on four fingers and so the weight on each finger is only 17 kg. The timing of raising should be when you say "up" so that all the four exert force at the same time. Moreover, the momentum of the first force used to raise the stone reduces its weight on the finger tips. 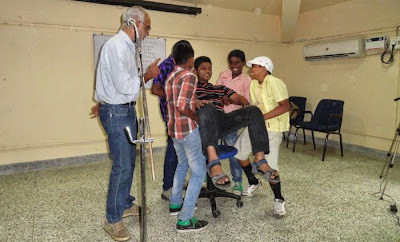 Effect: Four volunteers lift a person weighing more than 70 kg to 150 kg. on their finger tips without feeling any weight. Uri Geller, the self­-professed psychic demonstrated this trick claiming it to be by his psychic power. Props: A stool, a person weighing more than 70 kg. and four volunteers to lift him. Method: The volunteer to be raised sits straight on the stool with his hands on his knees and his legs straight. The other four volunteers clasp both their hands, closing all the fingers except the index fingers kept straight touching each other. Two tall volunteers stand at the back with their index fingers under the arm pits of the person to be raised. The other two place their index fingers under the knee joints and prepare to lift. While saying ‘one, two, three’ they get ready and when "up" is said, they raise the person and lower him gently. The timing of lifting the person at the same time makes the person go up. Though there are hundreds of such miracles happening at the places of worship and narrated in the scriptures of every religion we shall go into those miracles at a later stage. You are old & i suggest you to pls retire & stay at home. What research you want to do. Pls don't interfere in religious matter, if still then pls rearch on you religion. People like you distinguish & make people to fight each other. I Suggest pls stay away of it. We believe & prayer to him for his miracle. I had a bad thing pending from 6 years...tried each and every method...went and asked in the Dargah on 2 nd oct 2014. And on 3 oct 2014 my long pending matter in court got closed in my favour! Going back tomorrow! Please don't interfer Islam. First study it and then comment on it. Religion and science are two different things. Both importance in our lives. But, they can not be compared. Please study Islam first. It supports science but not dis beliefs. Muslims don't believe in Idol worship at all, I request you to please don't spread the false message that Muslims still believe in a stone at a Xyz place. And please study well before referring to Mosque and Dargah because these are two different places all together. You are an gullible idiot & will remain such throughout your life. Muslims are idiots, terrorists & idolators while they claim they are not... try burning koran..
Utmost false information, about the principles of Islam. This article states that "There remains one stone in Kaba worshipped by Muslims. ", This is not true. Muslims do not worship any stone and idol worship is the gravest of all sins in Islam. The sole power is with Almighty Allah and He alone is the creator of all things. As far as your misconception about the stone in Holy Kabah -"Hajr e Aswad", it is the sacred stone which has descended from the heaven, and Muslims do consider it sacred and see it as a miracle of Allah the most praiseworthy,but Muslims do not worship the stone. Muslims worship the creator of everything i.e. Allah the most high. Sincere request to study and know Islam before publishing such thoughts. Actual reason batau how the stone is lifted. It's 110% true that's it lifted, what's the reason I don't know.